This is an ideal recipe to make to the little ones, for the soft and sweet combination of flavors. Besides the burritos are wrapped in such a beautiful way, that anyone would like to eat them. 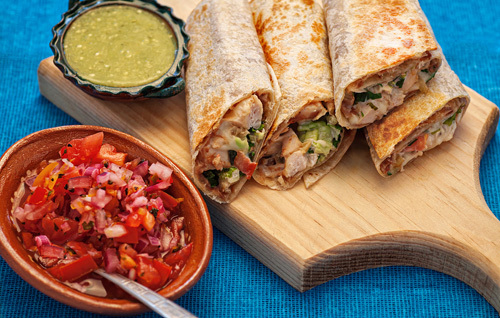 The burritos basically consist of rolled flour tortillas, which have many ingredients inside . In this recipe the burritos are filled with chicken, refried beans, cheese, tomato, onion, cream, lettuce and many more ingredients that generate an extraordinary flavor. What is formidable about this recipe, is that the burritos can be served at any hour of the day... as breakfast , as lunch, as antojito or if they are served as main course they can be accompanied with mixed salad , coleslaw , cucumber and yogurt salad , carrot salad with cream , red rice , pot beans , etc. – Unfortunately the burritos recipe has suffered many variations, mainly by the Tex-Mex versions. But don’t worry because here you will prepare authentic Mexican burritos. To make the burritos there are many steps to follow, therefore pay lots of attention so your burritos will be a success. Normally the burritos are prepared with extra-large flour tortillas, of 10 to 12’’ in diameter. The refried beans that are used in this recipe, can be bought canned or prepare them yourself and they will taste thousand times better. It is very important to use a cheese that melts in the burritos like the Chihuahua cheese, the Adobera cheese, the Monterey Jack cheese, etc. Dice 1/2 onion and 2 tomatoes; then set aside. Clean 2 skinless and boneless chicken breasts. Dice the chicken breasts that were cleaned and reserve. Put in the frying pan the onion dices that were cut and fry them for approximately 1 minute, until they look a bit transparent; stir regularly. The Chicken dices that were cut. Mix the frying pan ingredients and fry them for about 5 minutes, until the chicken is well cooked; stir regularly. Then set aside. Some of the Chicken that was cooked. Sprinkle some of the Coriander that was minced. The cheese is placed in-between the warm beans and the warm chicken so the heat of these 2 ingredients will melt the cheese. Fold the tortilla ends inwards and then roll the chicken burrito as taco. Suggestion: A salsa can be put to these burritos or they can be accompanied with some pickled chilies. Variation: The burritos can also be prepared with beef. Did you like the Chicken Burrito? These are some tasty refried beans that you can use in this recipe.